Windows 10 is a great operating system from a usability standpoint. Unfortunately, between the privacy issues and Microsoft's unethical upgrade tactics, more and more folks are turned off to it. Luckily, thanks to Linux, users don't have to tolerate the company's shady behavior. If you want to switch to Linux, please know that while Ubuntu is a great operating system, it is not the only OS based on that kernel. Quite frankly, there are too many distributions, but I digress. 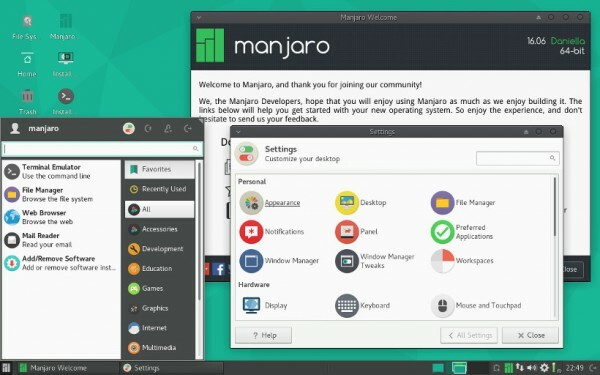 Another fairly easy-to-use Linux-based operating system is Manjaro. For many folks leaving Windows, the default UI should be an inviting sight. Today, version 16.06 code-named "Daniella" becomes available for download. Will you format your Windows drive and join the Linux community? "The Xfce edition remains our flagship offering and has received the attention it deserves. Few can claim to offer such a polished, integrated and leading-edge Xfce experience. We ship Xfce 4.12 with this release of Manjaro. We mainly focused on polishing the user experience on the desktop and window manager, and on updating some components to take advantage of newly available technologies such as switching to a new Vertex-Maia theme, we already using known as Maia for our KDE edition", says Philip Müller, Manjaro Development Team. Müller further says, "our KDE edition continues to deliver this powerful, mature and feature-rich desktop environment with a unique look-and-feel, and with the perks of Manjaro’s latest tools. We ship now Plasma 5.6 desktop in combination with the latest KDE-Apps 16.04. It was a huge step to get it all playing together smoothly and to give the user experience the same feeling as our KDE editions of the past". The Manjaro Development Team highlights the following changes. Kernel 4.4 LTS is used for this release, such as the latest drivers available to date. Relative to the last installation media release, our tools have been improved and polished. The Manjaro Settings Manager (MSM) now provides an easy-to-use graphical interface for installing and removing the many series of kernels we offer. Manjaro's selection of available kernels remains the most extensive of all Linux distribution we know of. At the time of this 16.06 release, eleven kernel-series are available directly from our binary repositories, ranging from the mature & rock-solid 3.10 series to the latest 4.6 release. Such a wide array of available kernel options results in extensive hardware support, getting the most out of your system for you, be it old or new. If you want to give the stable and beautiful 'Daniella' a go, you can download it here. Keep in mind, however, moving from Windows to a Linux-based operating system is a huge move -- a decision that should not be taken lightly. While many BetaNews readers are advanced and capable, if you are not comfortable, just don't do it. With that said, if you mostly live in a web browser like many people nowadays, you should be absolutely fine. If you are using specialized Windows-only software, the transition may not be possible. It would be wise to test Manjaro on a spare computer, virtual machine, or second storage drive until you are fully acclimated. Have you been considering a move from Windows to Linux because of Microsoft's disrespectful tactics? Tell me in the comments.